Fungi, the group of organisms mushroom-forming species belong to, are found as the largest organisms on earth, covering up to 15 hectares of soil. They are indispensable for the recycling of organic material, and as recent evidence suggests possibly capable of degrading even plastics. For these degradation processes mushrooms use specialized, powerful enzymes, that may be useful in many industrial applications as well as for the production of second-generation biofuel and biobased chemicals. Basidiomycetes are the fungi that produce spores in basidia, pedestal-like structures, with gills or pores. They include most mushrooms. Mushrooms are used on large-scale as a component of the human diet world-wide, either cultivated at mushroom growing farms or harvested in forests. 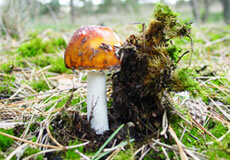 The variety of known mushroom species is tremendous, mushrooms varying in taste, colour, mushroom morphology. Mushrooms are considered very healthy food and they possess bioactive ingredients not found in other foodstuff such as vegetables. They are reported to give health-promoting effects, or, as even suggested in multiple recent studies, disease-preventing or –curing outcome (immune suppressing, anti-tumor, anti-diabetes, cholesterol-lowering). Hence, mushrooms are a group of organisms with very diverse, interesting characteristics offering a wide range of possible applications. BasidioFactory has become a member of the Industrial Platform of the Kluyver Centre for Genomics of Industrial Fermentations.